Discussion in 'Introductions' started by Emma Goldband, Feb 11, 2019. Hello my name is Emma. I have been collecting pins since I was a wee baby but really got into it around 2003. At this point I only collect Lilo and Stitch pins or ones that really appeal to me. I know I dont have a very large collection but I love what I have and the hunt for new ones. I'll post a picture of my Lilo and Stitch Pin board, I have somewhere around 100 but I keep getting lost when trying to count them! stitchismyspiritanimal and DisneyJ like this. Hello and welcome! Great collection! There are sooooo many stitch pins out there, so it's good to only get what you really like. Hi and Welcome! Stitch is a great character to collect - love him! Welcome Emma! When collecting a theme as massive as Stitch, I think you're very smart to just pursue the ones you love. After all, if you don't love your pins, why are you collecting them? Thanks for sharing your beautiful collection with us - and we're looking forward to watching it grow with you! Exactly! I'm not going to lie if I go to the park and I see stitch I buy stitch but for older pins I only buy what I love Haha. Welcome to the Ohana! 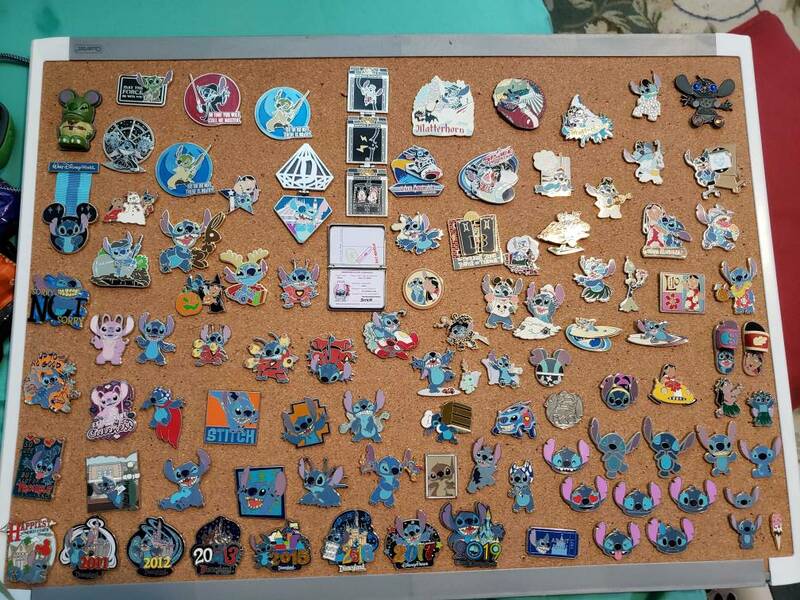 I started collecting Stitch about 10 years ago and man does he have a lot of pins out there! I especially love the ones where he "invades" other movies and dresses like other characters. Welcome aboard, and happy pin hunting! Now THAT's a challenge!! I think Stitch takes the record of most pins (as I'm sure you know). Welcome to the Forum and thanks for sharing a picture of your collection. I'm sure you'll have lots of opportunities to ad to it here.